Peaceful Anarchism 034 features an interview of Gabriel Scheare, of Fort Galt and the underground homebirth movement in Chile, by Danilo Cuellar. Topics include: Galt’s Gulch Chile, Exosphere, Cryptacademy, bitcoin and cryptocurrency, his underground homebirth story, Danilo’s waterbirth experiences, vaccinations, sovereign immunity, Jordan Peterson, Ayn Rand, and more. Peaceful Anarchism 034 features an interview of Mary J. Ruwart, author of Healing Our World: The Compassion of Libertarianism, by Danilo Cuellar. Topics include: justice, the not so wild Wild West, prisons, the broken window fallacy and the state, modern poverty, economic freedom, battered citizen syndrom, neighbors, economics, private security, love, charity, and many more. Peaceful Anarchism 031 features an interview of Antony Sameroff, host and founder of the Scottish Liberty Podcast, by Danilo Cuellar. 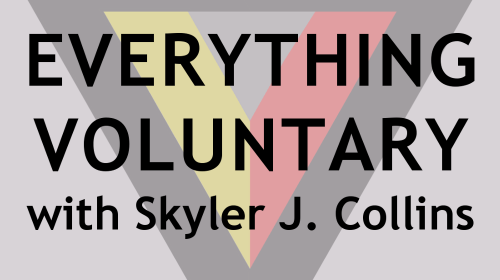 Topics include: his journey to libertarianism, the humility of voluntaryists, minimum wage, his podcast, capitalism, the state, profit and loss, poverty, selfishness, thinking like an economist, and more. Peaceful Anarchism 030 features an interview of Tim Brochu, co-host and co-founder of Anarchitecture Podcast, by Danilo Cuellar. Topics include: libertarianism, colonizing the moon, private ownership of public spaces, national defense, the 90s, infrastructure and utilities in a stateless society, the preservation of green spaces, roads, and more.